Shopping for someone but not sure what to give them? 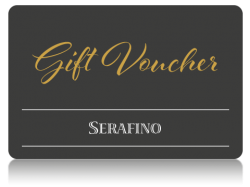 Give the gift of choice with a Serafino Gift Card. Our gift Cards are delivered to the recipient via email. The email includes the value, unique voucher code, a message from the sender and instructions to redeem the voucher at checkout. Gift Cards are valid for 36 months from the date of issue and can be used online and when you visit Serafino. Read our gift voucher terms and conditions.